Custom-designed jewelry, top-designer fashion, original art, a funky former oyster factory, exquisite streetscaping and the world's first Street Concierge make the experience of Naples browsing, buying, and window-yearning one-of-a-kind. In historic shopping districts and waterfront plazas, shoppers can find treasures such as unique medallion jewelry, an original Dali etching, Southwest Florida's most extensive selection of Portmeirion tableware and Donna Karan python pumps. Bayfront Naples - Strategically situated on Naples Bay and at the foot of Fifth Avenue South, there is nothing modest about this upscale oasis. Bayfront's colorful European architecture is an eye catching and memorable landmark in Old Naples. Strolling on brick-laden pathways, shoppers have intimate access to all their needs. Rare finds in the shops coupled with the impeccable cuisine of the restaurants take the Bayfront experience to a new level. There's always a new opportunity to enhance the day at Bayfront. World-class crafts by famous designers and artisans are found in their stores. Highly trained culinary teams work in their kitchens. The restaurants' gourmet fare is complimented by an atmosphere ranging from informal to lavish, depending on the diner's mood or taste. The shops are detailed in exquisite woodwork, imported stone, artistic displays and staffed by friendly, knowledgeable representatives to complete the "total" shopping experience. Waterside Shops - Surrounded by rock waterfalls and lush tropical landscaping, exclusive boutiques sell haute couture fashion, one-of-a-kind jewelry and other distinctive merchandise. Located in Pelican Bay, at Seagate Drive and Tamiami Trail North. The Village of Venetian Bay - Evoking a canal-side town in Italy, this is a sophisticated domain of fashion, jewelry, gourmet shops and fine restaurants, most of them with a placid waterside view. Coastland Center - At the core of new Naples, it occupies more than 950,000 square feet, making it Naples' largest and only enclosed, climate-controlled shopping center. The mall's 150 stores include a full array of shopping options, from major department stores to small specialty shops, all in a charming Key West ambiance. Fifth Avenue South - At one time, members of the Seminole Indian tribe sold their crafts from a stand on Fifth Avenue. Today, it's one of Naples' most fashionable addresses. Boutiques, antique shops, galleries, financial houses, bistros and restaurants line Naples' bustling main street. Its continuing renewal has brought restaurants out onto the sidewalks adjacent to the landscaped promenades, and has sparked the genesis of what has been termed Naples' "cafe society." The Avenue's specialty shops range from a Haitian crafts shop to a world-class art gallery and a 50-year-old family-run gourmet grocery. 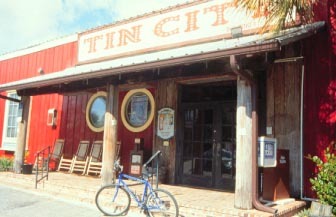 Tin City - This funky, ramshackle waterside shopping spot occupies an old oyster-processing plant with 40 shops and two restaurants. It specializes in sea-themed gifts, dining on the water and boat charters and tours. 1200 Fifth Avenue South. Third Street South - Old Naples' most fashionable shopping district, it blends new and old, and has its own Street Concierge. You will find elegant shops, restaurants, extraordinary galleries, and one-of-a-kind boutiques offering haute couture, resort clothes, fine art, jewelry, and home fashions. It encompasses Broad Avenue to 14th Avenue South. Prime Outlets at Naples - Home to over 40 name-brand outlet stores, the open-air center offers exciting shopping with discounts up to 70 percent off everyday retail on famous fashion designer labels. Located in south Collier County on State Road 951. Wynn's Market - Fine Foods - The best groceries, produce, meats, and baked goods available in Naples Florida. Deli, catering, wines, organic products - now order lunch online!